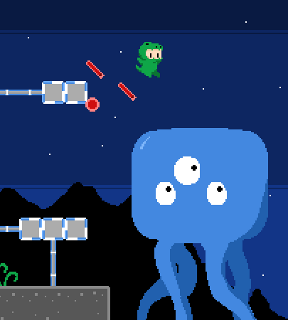 Rexzilla is a retro-styled platform game created by Orz Laboratory. Starring a kid in a dinosaur costume and featuring space travel, evil aliens, strange environments, and gumballs, it captures a bit of childlike wonder as you jump and stomp your way across 50 levels of action. Late one night, Rex scoots off to bed only to be awoken a few hours later. Heading out to his balcony, he spots a pair of aliens absconding into the darkness, gloating about all the gumballs they've taken from Rex. Well, he's not going to take an insult such as that! Donning his dinosaur suit, which turns Rex into 50% human, 50% dinosaur, and 100% awesome, he heads out into the night and leaps into space, following the evil aliens to put a stop to their plans. Rexzilla puts all the basic basic walking, jumping and firing skills at your disposal. In addition to making it to the teleporter exit in each stage, you'll also pick up gumballs to activate the exit as well as supply Rex with a little firepower. Rex can hop on most enemies to defeat them, but you'll spend most of your time keeping the little 'saur out of danger by being quick on your feet. Rexzilla is very much the type of platformer that emphasizes speed, accuracy and the occasional puzzle situation over raw combat. Analysis: There's something innocently appealing about a game starring a boy in a dinosaur costume. Rexzilla is a simple sort of game that doesn't try to throw a bunch of features into the pot just so it can list them bullet point-style in a press release. Instead, what we have here is a very pristine and retro-feeling platform game with an above average level of challenge and an above average level of charm. Working your way through the increasingly complex levels to pick up gumballs takes a bit of finesse. 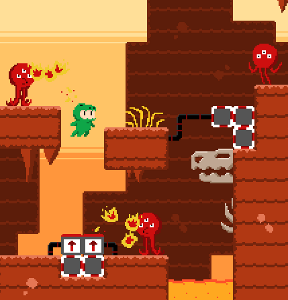 Alien enemies are everywhere, no matter which of the game's five environments you're in, and you don't always have a handy way to deal with them. Avoidance and often pure lock are your best tools. How else would you expect a kid to save the galaxy? Rexzilla is a straightforward but satisfying game. It keeps surprising you with new things every few levels, such as disappearing blocks or battles with giant bosses. The artwork and music are imaginative, and the whole experience is engaging from beginning to end.